The current traffic split from west of Estancia to 64th Street on the south side of Central is expected to remain in place through Tuesday, Aug. 30. This is pending weather conditions. Crews are expected to pave on Friday and Saturday but may have to postpone if the ground is too wet. Also, crews are expected to place a line stop on a major water line that needs to be abandoned in place late Wednesday night/early Thursday morning. Also next week, on Wednesday, Aug. 31 and for one day only, crews will complete some final work on the north side of Central between 57th Street and Yucca. If everything goes well, the contractor, TLC, expects to have this part of the project complete as of Friday, Sept. 2 (in time for Labor Day weekend). Crews expect to start construction on a 6-inch waterline next Monday, Aug. 29. There will be a “taper” just south of Atrisco (where one lane is closed) but westbound traffic will be able to turn right, heading south on Atrisco. After Atrisco, the outside eastbound lane (closest to the curb) will be closed to Sunset. Sunset will be open, however, and traffic will be allowed to turn right (heading south) on Sunset. Work hours will probably be Monday-Friday 7am-7pm but I will need to confirm this. We don’t have a schedule on how long this work will take, but suspect it will be 2-3 weeks. Due to the Balloon Fiesta moratorium, crews will get this part of the project done, then take a break and come back on Oct. 10 to finish the rest of the project. The rest of the project involves a new 12-inch water line plus abandoning some lines in place and will probably take about 3-4 weeks. Beginning Monday, May 9, 2016, and lasting through mid to late summer 2016, the Water Authority will relocate water lines on Central between Coors and Yucca that are in conflict with the Albuquerque Rapid Transit (ART) project. As part of this project, new fire hydrants may be installed as needed. Smith Engineering is the engineer for the project and TLC Plumbing & Utility is the contractor. Regular work hours will be Monday-Saturday 7 a.m. to 9 p.m., although the contractor may work additional hours if needed. Area residents and businesses will be notified in advance of any planned water shutoffs. Access will be maintained to all businesses and residences. 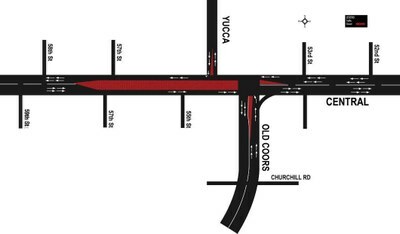 May 9-11, 2016: The contractor will tear down medians on Central Avenue between Yucca and 58th Street, so the inside lanes for eastbound and westbound traffic will be closed from 53rd Street to west of 57th Street, with one lane of traffic open in each direction. Westbound traffic will not be able to turn left on 55th or 57th streets. Eastbound traffic will not be able to turn left on 57th Street or Yucca. 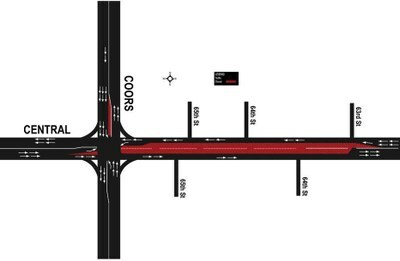 Also, the contractor will tear down medians on Central Avenue from just east of Coors to 63rd Street. One lane of traffic will remain open eastbound and westbound with center lanes closed. Westbound traffic will not be able to turn left on 64th or 65th streets. Eastbound traffic will not be able to turn left on 63rd, 63th, or 65th streets. This work is being done to prepare for upcoming traffic re-configurations in order to move the water lines. Visit Albuquerque Rapid Transit website.